University of Oklahoma head men’s basketball coach Lon Kruger announced Wednesday the hiring of Kevin Kruger as assistant coach. The son of Lon Kruger, Kevin returns to Norman after spending the past two seasons as an assistant coach for Northern Arizona University. Prior to NAU, he spent the 2013-14 campaign serving as a graduate assistant for the Sooners. Kevin Kruger, now age 32, had professional basketball stints in Bulgaria, Italy, China, Mexico, Belgium and Germany in addition to NBA training camp invitations from the Orlando Magic and Milwaukee Bucks. He also played with the Utah Flash and Los Angeles D-Fenders of the NBA D-League before launching his coaching career at OU. Collegiately, Kruger played three seasons for Arizona State from 2003-06. After earning a criminal justice degree from ASU, he transferred to UNLV to play for his father, who was the head coach prior to moving to Oklahoma. 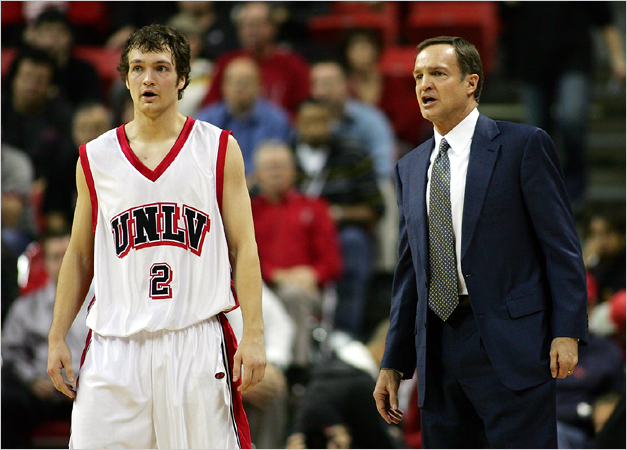 In his one season at UNLV in 2006-07, Kruger helped the Rebels win 30 games and reach the Sweet 16 in the NCAA Tournament for the first time since 1991. He earned All-Mountain West Third Team honors and was named to the conference’s all-tournament team. Kruger was named an honorable mention All-Pac-10 and second-team NABC District 15 selection in his third and final season at Arizona State. Also a Pac-10 All-Freshman honorable mention pick, Kruger left the Sun Devils ranked fourth in career free throw percentage at ASU, fifth all-time in 3-pointers made and attempted and seventh in 3-point percentage. Following Kevin Kruger’s hire, OU still has one assistant coaching position to fill after former assistants Lew Hill and Steve Henson accepted head coaching jobs at UTRGV and UTSA, respectively, earlier this month.